Till 2006 Bharat Forge (BF) was primarily an auto components firm. A number of mergers and acquisitions in the 2004-07 periods saw BF also enter in several new geographies. Manufacturing is in 11 locations and 5 countries: India (4), Germany (3), China (2), Sweden (1) and USA (1). The fall in auto demand in 2007-09 saw cost cutting measures rolled out to lower the break even for manufacturing facilities. Capacity utilization improved from 53% in 2009, to 70% for standalone and 45% for international entities in 2010. 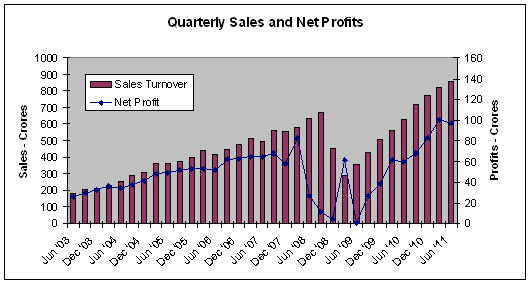 Additional improvements have contributed significantly to profits. All overseas subsidiaries, including its JV in China, FAW Bharat Forge, have see a turnaround and have started contributing to the bottom line, a year ahead of the 2012 target. The auto market began to revive in 2009, and BF was best placed to take advantage of this trend. In June 2011, Bharat Forge quarterly revenues surged to 857 crores, an all time high. The Business environment and demand situation has now become very positive. BF is able to take advantage of surging demand due to spare capacities, low cost production, global presence and nimble design capabilities. Also a series of well timed entries into new non-automotive markets. The stock price peaked in 2006 and has not touched those levels since. But BF has seen a dramatic business recovery in the last two years in terms of Earnings per share – EPS, which has already risen to all time highs. While the BF stock has given investors only 11% CAGR returns over a 7-year period, the aggressive nature of this firm means that the initial period of rapid gain was followed by a period of restructuring and consolidation. The expectation now is another period of rapid gain on all parameters. Debt-equity is 0.74 as of Mar’11 (down from 1.21 in ‘10). This is comfortable, and safe. ROCE and RONW are in 15-17% range indicating healthy returns. 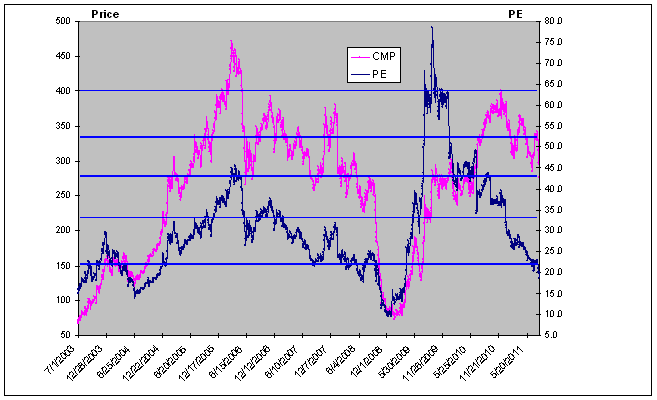 PE has fallen to reasonable levels (compared to historical) indicating safety in investments at this level. EPS has moved to all time highs. With a suitable lag, this will be followed by stock price also moving into new highs. The stock will appreciate to Market Price of 700 in 12-14 months. 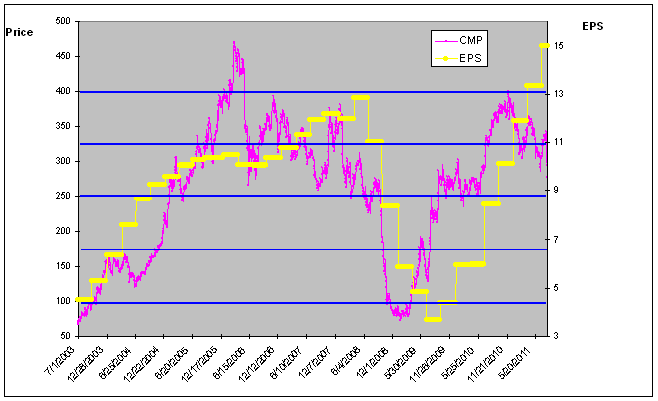 This is based on an expected PE of 30 range and continued EPS growth seen since the bottom of June 2009. This is an excellent entry point for this stock as it is currently underpriced and ‘out of favour’. The current market weakness has dragged down the market price of the stock. With overall Sensex / market recovery expected in 6-9 months, this share price is expected to recover rapidly. Auto sector demand in India has been tapering off in recent months. It is expected to have lower growth for 2-3 quarters before recovering. Auto Exports however from India are accelerating. Headwinds, such as Higher raw-material costs like steel and power may restrict margin expansion and EPS growth. The rising commodity costs have hit manufacturers like Bharat Forge. In recent months the increase in interest rates and slowdown in the economy has slowed the growth of the auto industry, particularly in India. However, both these events appear to have played out/peaked, and will stabilise/ reduce in the near future. Business complexity has increased due to addition of a number of new verticals. However, BF is already seeing exciting success from the new ventures. 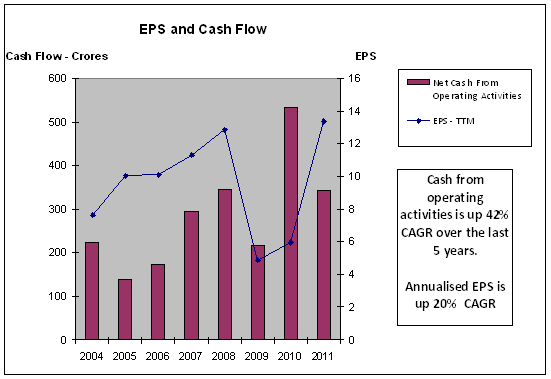 An increase in working Capital in the firm in 2011 saw the Cash Flow fall this year. This stems from investments in new businesses as well as new investments in the Auto business to increase capacity and de-bottlenecking. External factors like stock market sentiments. However our current view is that this will revert to a positive state over the next 9-12 months. Check back on the website www.jainmatrix.com for updates. Do you find this site useful? Please comment below. You can also subscribe for my posts by filling the ‘Sign me up’ box on top right of this page.